Start off your visit on the 10th (Wed): explore the galleries of Doge's Palace, take in panoramic vistas at St Mark's Campanile, admire the landmark architecture of Basilica di San Marco, then take in the architecture and atmosphere at Basilica di Santa Maria della Salute, and finally explore the activities along Canal Grande. Get ready for a full day of sightseeing on the next day: take in the views from Ponte di Rialto, steep yourself in history at Ponte dei Sospiri, then explore the world behind art at Peggy Guggenheim Collection, and finally appreciate the extensive heritage of St. Mark's Square. For photos, maps, and more tourist information, read our Venice trip itinerary maker site . Detroit, USA to Venice is an approximately 14-hour flight. You can also do a combination of bus and flight; or do a combination of train and flight. You'll lose 6 hours traveling from Detroit to Venice due to the time zone difference. In July, daytime highs in Venice are 87°F, while nighttime lows are 67°F. Wrap up your sightseeing on the 11th (Thu) to allow time to take a train to Bologna. Kick off your visit on the 12th (Fri): indulge your taste buds at Food & Drink, then contemplate in the serene atmosphere at Basilica - Santuario di Santo Stefano, then make a trip to Torri degli Asinelli e Garisenda, and finally pause for some serene contemplation at Basilica di San Petronio. For photos and more tourist information, refer to the Bologna itinerary planner. Traveling by train from Venice to Bologna takes 1.5 hours. Alternatively, you can drive; or take a bus. In July, plan for daily highs up to 89°F, and evening lows to 67°F. Finish up your sightseeing early on the 12th (Fri) so you can catch the train to Florence. Start off your visit on the 13th (Sat): contemplate the long history of Torre di Arnolfo, explore the world behind art at Uffizi Galleries, then snap pictures at Ponte Vecchio, then get engrossed in the history at Basilica di Santa Croce, and finally examine the collection at Galleria dell'Accademia. On the 14th (Sun), you'll have a packed day of sightseeing: enjoy breathtaking views from The Tower of Palazzo Vecchio, admire the masterpieces at Pitti Palace, take some stellar pictures from Piazzale Michelangelo, take in the spiritual surroundings of Cathedral of Santa Maria del Fiore, then enjoy breathtaking views from Campanile di Giotto, and finally appreciate the extensive heritage of Piazza del Duomo. To find traveler tips, ratings, photos, and other tourist information, use the Florence sightseeing planning site . Take a train from Bologna to Florence in an hour. Alternatively, you can drive; or take a bus. In July in Florence, expect temperatures between 86°F during the day and 65°F at night. 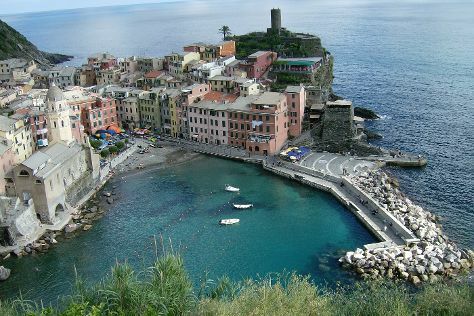 Finish up your sightseeing early on the 14th (Sun) so you can go by car to Cinque Terre. Kick off your visit on the 15th (Mon): stroll through Beach Bar Stella Marina, hike along Footpath Monterosso - Vernazza, and then step into the grandiose world of Castello Doria. Get ready for a full day of sightseeing on the next day: take a stroll around Vernazza, take in the architecture and atmosphere at Santa Margherita di Antiochia Church, trek along Cinque Terre Trails, then learn about winemaking at Terra di Bargon, and finally take in the architecture and atmosphere at Convento dei Cappuccini e Chiesa di San Francesco. To see where to stay, ratings, reviews, and tourist information, read our Cinque Terre route planner . You can drive from Florence to Cinque Terre in 2.5 hours. Another option is to take a train. In July in Cinque Terre, expect temperatures between 86°F during the day and 65°F at night. Finish up your sightseeing early on the 16th (Tue) so you can catch the train to Portofino. Portofino is an Italian fishing village and holiday resort famous for its picturesque harbour and historical association with celebrity and artistic visitors. For ratings, maps, and more tourist information, use the Portofino online trip builder . Getting from Cinque Terre to Portofino by train takes about an hour. Other options: drive. Traveling from Cinque Terre in July, you can expect nighttime temperatures to be somewhat warmer in Portofino, with lows of 71°F. You'll set off for home on the 17th (Wed).